USM and the Sisters of Charity of Leavenworth celebrated National Catholic Sisters Week March 14-18. Focused on the religious community’s legacy of social justice, De Paul Library exhibited a display capturing the SCL history and their ministries of social justice following the Second Vatican Council. The week also included a showing of the documentary “Band of Sisters,” a panel discussion centered on justice for the voiceless, and a sister-student lunch in Saint Joseph Dining Hall. Freshman Lydia Paterson, a biology major, is headed to the Olympic Trials for 10m Air Pistol in June! A first place finish at the Trials would secure a “Quota Place”—a ticket to compete at the Summer Olympic Games in Rio. Lydia is one of the youngest pistol shooters to ever make the National team (and if she qualifies for the Olympics, she’ll be the youngest Olympic pistol shooter in history). Though she’s young, Lydia is anything but a rookie. She took the U.S. Junior National Championship title in April; she’s been competing at an elite-level since 2012; and she holds the Junior National Record for women’s pistol shooters — scoring 388/400 points (world record stands at 393/400). If Lydia qualifies for the Games, it wouldn’t be her first time in Brazil for a competition—she actually just got back from the World Cup last month. And it’s definitely not the farthest she’s ever traveled from home either. At over 6,600 miles from the States, Azerbaijan takes that prize. 3. Eat, Sleep, Study, RUN! University of Saint Mary Stefani Doctor of Physical Therapy student Addie Swyden crossed the finish line at the 2016 Boston Marathon on April 18. Because of her impressive time (3:22:16—7:42 pace), she automatically qualifies for next year’s run. Nice work, Addie! On Feb. 15, the University of Saint Mary presented the 18th annual Lincoln Event, “The First Visual Presidency: How Abraham Lincoln Used Photography for Politics.” Presenter David C. Ward, senior historian at the Smithsonian National Portrait Gallery, explored the important role photography played in Abraham Lincoln’s political career and legacy. The evening’s presentation was recorded by a crew from C-SPAN, and its debut broadcast aired April 3 in the “Presidency” slot on C-SPAN 3 and American History TV. Ward’s presentation is online at stmary.edu/CSPAN. 5. Living the Saint Mary Mission in Mexico! Seven USM nursing students traveled to Puerto Peñasco, Mexico over Spring Break. Saint Mary senior Courtney McCoy shared a journal reflection on the service-learning trip. For us to take their vitals and provide basic care meant more to them than if we had given their community a million dollars. The amount of gratitude we saw is something that words can’t even describe. I have been on multiple mission trips throughout high school and college—but this one was unlike any other. 61% of USM faculty and staff generously give to our NEW Family Fund, our internal giving program for USM faculty and staff! “USM was honored to welcome the Kansas Court of Appeals to our historic campus. This was a wonderful opportunity for our students and community to see court in action,” said Dr. Karenbeth Zacharias, director of USM’s Lawrence D. Starr Global Studies Institute. Along with hearing oral arguments for six cases, Judges Karen Arnold-Burger, Henry W. Green, and Steve Leben met with First-Year Experience students and criminology, psychology, and history majors, and enjoyed lunch with our Honors Students. On April 18, Saint Mary co-presented “The People’s Pope: The Man, the Pope, and the Challenge of Change” with David Willey, 40-year veteran BBC correspondent for Vatican City, at the Kansas City Public Library Plaza Branch. With his unparalleled access to the inner workings of the Vatican, Willey chronicled how a man who confounded all predictions came to lead the Catholic Church as the first-ever Pontiff from the Americas. Leading the Church in a time of turmoil, scandal, and flux, Pope Francis has found a way to impact millions around the world with his direct speeches, humble demeanor, and compassionate beliefs. Another amazing night goes down in history! 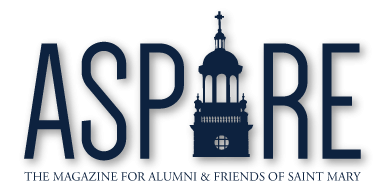 This year marked the 13th anniversary of SpireFest, the largest annual scholarship fundraiser at the University of Saint Mary. SpireFest 2016 brought together over 400 guests—raising more than $180,000 for USM student scholarships. Guests enjoyed bidding on silent auction items while USM’s very own Joe Contrucci, C’94, Cathy Newton, C’70, and senior Chaz Hardy graciously served as emcees. The band had everyone dancing, and our audience displayed their generosity all night. A big thank you to our Saint Mary Concert Chorale for performing, along with SpireFest 2016 Superstar Sponsors. Make sure to save the date for SpireFest 2017: April 1, 2017. +1 Congratulations, Class of 2016! On May 7, Saint Mary celebrated Commencement in the McGilley Field House. Families and friends, and USM faculty and staff gathered to congratulate 414 graduates—a group composed of 221 undergraduate degree recipients, 154 master’s degree recipients, and 39 doctoral degree recipients. Graduates hail from Kansas to California, from England to Kenya.